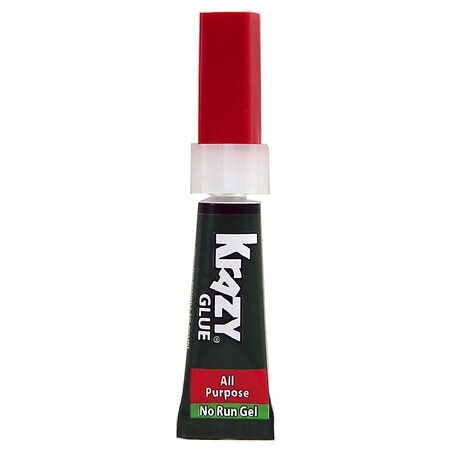 This glue forms a strong, long-lasting bond on most surfaces. Best for ceramic, rubber, glass, metal, wood, plastic (PVC, ABS, FRP), leather and vinyl. Not for use on paper, foam, rear view mirrors, polyethylene, or fluorinated resin. Do not put bonded items in oven or on stove. Do not use to attach artificial nails. Store in cool, dark place.. © 2006 Elmer's Products, Inc. EYE AND SKIN IRRITANT. BONDS SKIN INSTANTLY. Contains ethyl cyanoacrylate. Avoid contact with skin and eyes. If eye or mouth contact occurs, hold eyelid or mouth open and rinse thoroughly but gently with water only for 15 minutes and GET MEDICAL ATTENTION. Liquid glue will sting eye temporarily. Solidified glue may irritate eye like a grain of sand and should be treated by an eye doctor. If skin bonding occurs, soak in acetone-based nail polish remover or warm soapy water and carefully peel or roll skin apart (do not pull). Contact through clothing may cause skin burn. If spilled on clothing, flush with cold water. Avoid prolonged breathing of vapors. Use with adequate ventilation. KEEP OUT OF REACH OF CHILDREN. For emergency medical information only, call toll free 1-888-516-2502. For information only, call toll-free 1-888-435-6377..